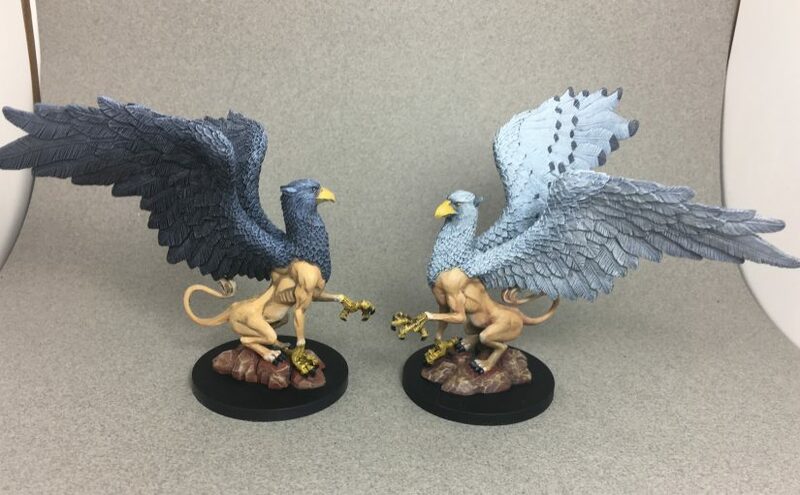 This is a pair of Reaper’s 03662 Griffons. One will be given to a friend as a gift, the other will go in my display cabinet. 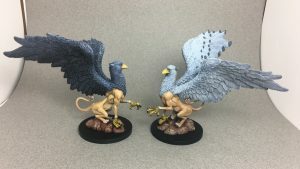 I agonized over the wings for a long time, wondering how to cover those large surfaces, whether I should do more fancy patterning on them, should I make them identical or different… The light wings were a little too blank, so I did the dark feather tips. 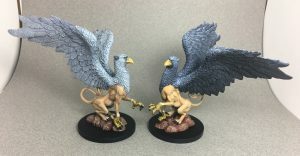 The dark wings had enough detail to satisfy me with the highlighting, so I didn’t do any further detail work on them. I was much more interested to do the lion bodies, which I wasn’t sure I could pull off well, but I’m happy with these results.